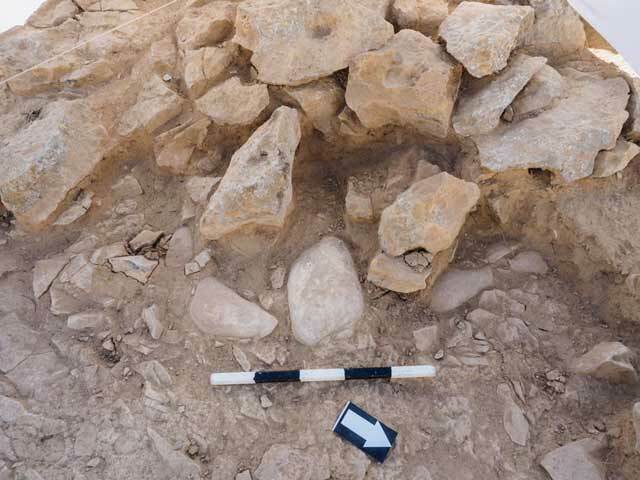 In November 2015, a salvage excavation was conducted at a prehistoric site on the outskirts of Mizpe Ramon (Permit No. A-7546; map ref. 180140/502780; Fig. 1), prior to construction. The excavation, undertaken on behalf of the Israel Antiquities Authority and financed by the Ministry of Housing, was directed by M. Oron and R. Lavi, with the assistance of Y. Abadi-Reiss and H. Hamer (area supervision), Y. Al-ʽAmor (administration), M. Kahan, M. Kunin and A. Hajian (surveying and drafting), A. Peretz (field photography), Y. Raskin (geomorphology), C. Amit (studio photography), as well as A. Karasik and A. German-Levanon (digital documentation). The site is located atop a rocky spur descending to the north. A vein of flint lenses runs along the spur, set between limestone strata that belong to the lower part of the Zafit formation. This geological vein attracted human activity over several periods, during which the flint was utilized as raw material for the manufacture of tools. 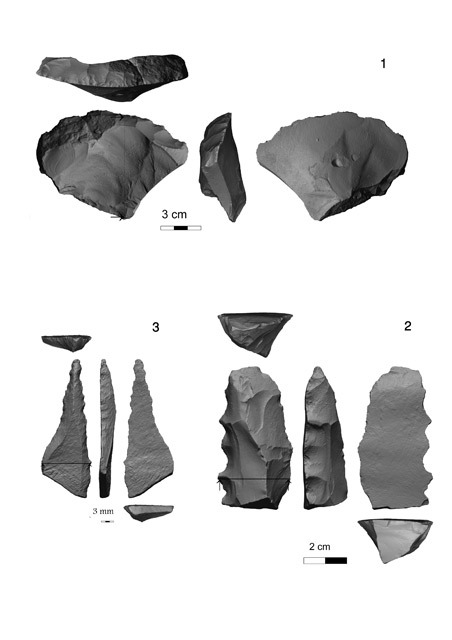 Surrounding the outcrops of the raw material along the spur were concentrations of knapped flint artifacts; these were collected and excavated in four areas (A–D; Fig. 2). The hills around Mizpe Ramon, including the area of the site, were surveyed in the past (Rosen and Golan 2016). A scattering of flint items from the Middle Paleolithic period was identified on a nearby spur (Rosen and Golan 2016: Site 171), where a new neighborhood now stands; Area B may possibly overlap the margins of this scattering. 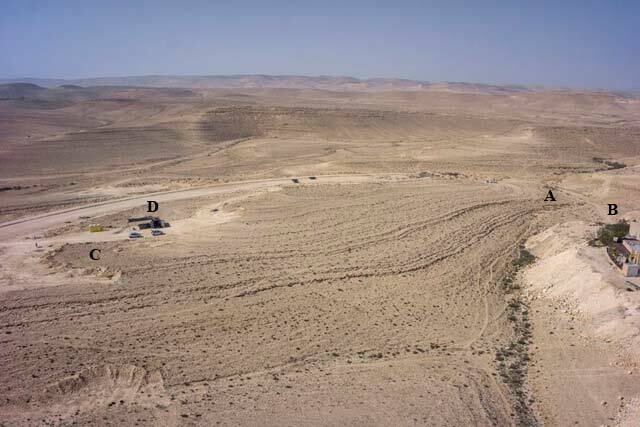 About 1 km south of the excavation lies the Early Bronze Age Camel Site, which exemplifies the culture of nomadic pastoralism in the Negev Highlands during this period (Rosen 2011). In October–November 2015, another excavation was conducted in a compound slated for development (Permit No. A-7544), where the remains of a nomadic pastoral site with several round structures were found. Despite their geographical proximity, it is difficult to determine at this stage whether there is a connection between the remains unearthed in that excavation and those of the excavation described herein. An area of ​​c. 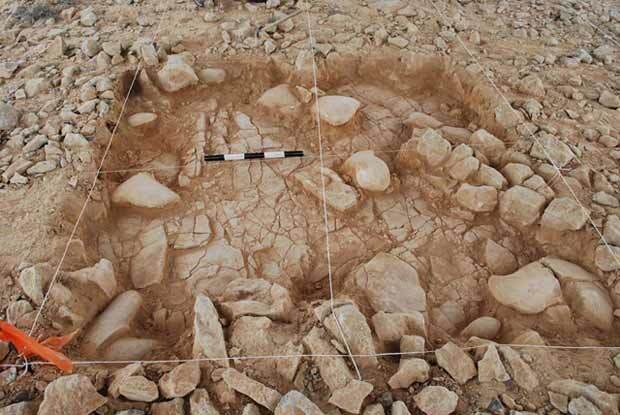 1,500 sq m bearing evidence of prehistoric and possibly protohistoric activity was examined. In Area A, an exceptionally well-preserved flint quarry, probably from the Neolithic period, was exposed; other areas yielded evidence of flint mining and knapping from the Middle and Upper Paleolithic and the Neolithic periods, and probably from the Bronze Age as well. The flint assemblages gathered from the surface of the four excavation areas are presented below. Area A. Two separate flint assemblages were collected near the foot of the spur’s northeastern slopes: one from the surface and the other from the excavation of the Neolithic-period quarry (to be published at length in the future). The concentration of flint artifacts identified on the surface prior to the excavation extended along a north–south axis (10 × 30 m). 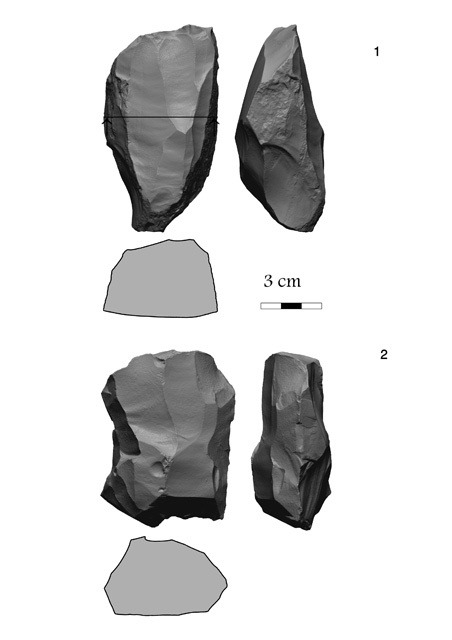 While excavating part of the quarry, which extends over some 200 sq m, a heap of limestone chunks was discovered—evidence of planned quarrying that involved the removal of the layer of limestone covering the flint vein in order to extract the lenses (Fig. 3). The flint lenses were separated from the bottom of the limestone chunks that were removed from the quarry; these were found nearby. Several lenses which were not detached from the rock were exposed in situ (Fig. 4). Numerous knapped flint items in an excellent state of preservation were discovered amongst the quarry stones, indicating that the shaping of the implements was done on-site shortly after quarrying. The flint assemblage includes blade cores, several of which are bi-directional, numerous blades and core trimmings, suggesting that the site was used for producing cores and blades. Only one formal tool was found in the entire assemblage: a bifacial implement exhibiting average craftsmanship. In addition, a spindle whorl fashioned from an unidentified type of stone was found. The flint artifacts found between the quarry stones bore white patination, unlike the flint items gathered on the surface, which had a dark brown patina. The flint assemblage collected on the surface and presented below is apparently different from the one that was recovered from between quarry stones, and they represent different periods of flint mining. It also seems that the assemblage in the quarrying debris was found in situ, whereas the items collected on the surface had eroded down the slope to some extent. Area B was located across the channel, along a spur that extends parallel to and east of the main spur of the site; its upper part had been damaged by construction work. All the flint items within a 60 sq m area were collected. No excavation was conducted; however, most of the bedrock surface was exposed, with no soil covering it. Flint lenses were identified in situ in the upper part of the excavation area, suggesting that this was the same geological horizon that was visible in Area A, to the west of the channel. Area C. A flint scattering, some of which was damaged by modern construction work, was spread over a large area at the top of a spur where the vein of flint was exposed on the surface. The bedrock surface was dotted with numerous depressions, indicating that flint lenses had been removed from the top of the limestone layer that is currently exposed. All of the flint items discerned within a 60 sq m area were collected, and significant items such as cores and tools, identified within an area of ​​100 sq m were mapped. Several squares (1 × 1 m) were excavated, exposing the bedrock surface at a depth of a few centimeters. 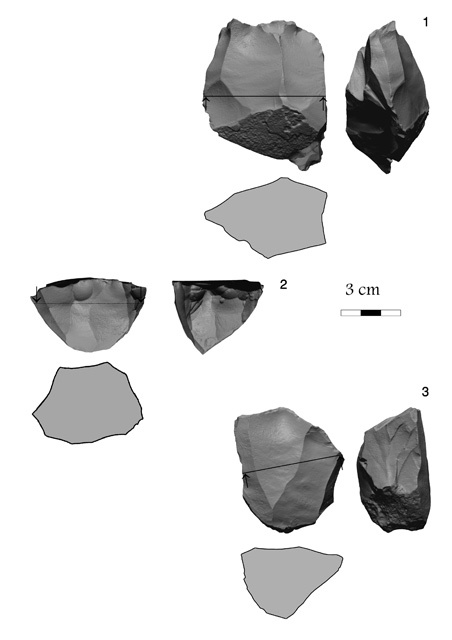 In situ flint lenses that were not utilized during the quarrying activity could be discerned (Fig. 5) below topsoil. The flint assemblage, which included a rather large quantity of cores, core trimmings and ad hoc tools, may likely contain mixed items from different periods. Area D. Numerous depressions were discerned in the bedrock in the western part of the spur, c. 30 m west of Area C, where the bedrock was completely exposed, indicating the removal of flint lenses. In situ flint lenses that were not utilized were also noted. Knapped flint items were scattered on the surface of a moderate slope descending to the west. All the flint artifacts within an area of ​​14 sq m were collected. The assemblage included large cores, debitage and ad hoc tools. The Flint Assemblage. The assemblage of knapped flint artifacts described here (N=17,710; Table 1) was collected from the surface in the four excavation areas (the flint assemblage from the quarry in Area A is the subject of a further, in-depth study and will therefore be treated in a separate publication). Because the flint comes from a surface collection and due to the paucity of diagnostic items, the assemblage will be described as a whole, despite the mix of knapping techniques from various periods; nevertheless, the differences between the areas will be noted. 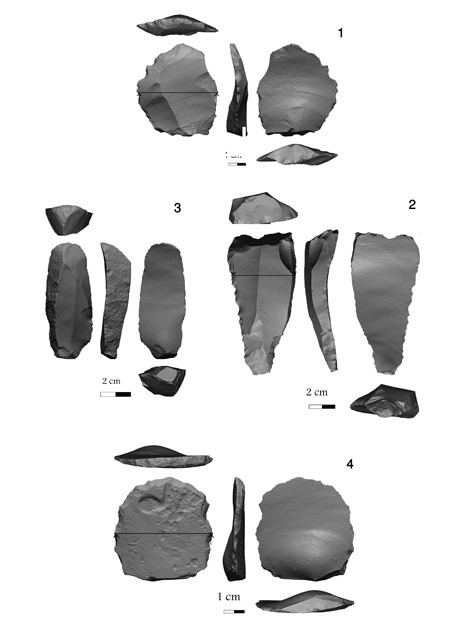 The assemblages are characteristic of knapping sites that are located near a source of raw material; these include a large number of primary items (>35% in all of the areas) and a low percentage of retouched items and formal tools. The percentage of chips, which generally indicates that the knapping was done on-site, varies from area to area, and it is apparent that the differences in percentage correspond with the gradient of the slope in the areas. In the level areas (B, C) the quantity of chips was large, while in Areas A and D the percentage was lower, probably due to erosion that occurred after the knapping activity took place. The number of cores is small, suggesting that in some instances the cores were pre-formed at the site and then taken away. Therefore, only the beginning of the reduction sequence is represented in the assemblage, consisting mainly of the removal of the calcareous cortex from the flint lenses. The core assemblage (Table 2; Fig. 6) is clearly dominated by a preference for the production of blades—generally short and broad blades—from cores with a single striking platform. Such cores are usually attributed to proto-historic times, from the Chalcolithic period to the Early Bronze Age (Rosen 1997). The assemblage also includes blade and bladelet cores that have opposing or perpendicular striking platforms and simple flake cores with one or more striking platforms (Fig. 7:1, 2), most of which cannot be attributed to a particular culture or period. An exception is a Levallois core (Fig. 7:3) found in Area C, which reflects activity in the Middle Paleolithic period. The tools (Table 3) in the assemblage are rare; they are all ad hoc and cannot be attributed to a specific culture or period. They consist mainly of retouched flakes and blades (66% of the tools; Fig. 8:1, 2) and denticulates and notches, as well as several end scrapers and side scrapers (Fig. 8:3, 4), massive tools (Fig. 9:1, 2), drills (Fig. 9:3) etc. Only one pounder was found in the assemblage; it is possible that good pounders were not available at the site and were therefore brought there and taken away by the tool makers after the knapping activity was completed. The knapping site at Mizpe Ramon (Areas B–D) served as a source for flint production for a long time in prehistoric and proto-historic periods, as an exposed geological vein of high-quality flint lenses was repeatedly exploited. The collected flint assemblages attest that the site served for initial knapping only; hence, no formal tools that could assist in attributing the assemblages to any specific chronological or cultural framework were found. However, there are general characteristics indicative of activity in three or four different periods. A few items can be ascribed to the Mousterian culture in the Middle Paleolithic period. Other items point to the Upper Paleolithic period, and most of the material—mainly the production of broad blades and the ad hoc flake industry—may belong to the Early Bronze Age. Such knapping sites, which are near geological flint sources, are common throughout the Negev, especially in the vicinity of ​​Mizpe Ramon (Rosen 2010). The Camel Site, a settlement dating from the Early Bronze Age (Rosen 2011), is located c. 1 km from the quarry site, and may have been the dwelling site for those who utilized the quarry. On the other hand, the flint quarry in Area A contains a homogenous flint assemblage, which based on a preliminary examination seems to date from the Neolithic period. Flint mining is a phenomenon known to have occurred in various periods and at many sites, but a quarry such as this, in which there is evidence of how the quarrying activity was carried out together with the assemblage of in situ detached flint items, is less common. The closest parallel is the flint quarry at Ramat Tamar, dating from the Pre-Pottery Neolithic B period (Barkai, Gopher and Weiner 2007). The state of preservation of the Mizpe Ramon quarry enables us to both reconstruct how the flint was mined and study the associated flint assemblage to learn about community organization and commercial activity. Barkai R., Gopher A. and Weiner J. 2007. Quarrying Flint at Neolithic Ramat Tamar: An Experiment. In L. Astruc, D. Binder and F. Briois. Systèmes techniques et communautés du Néolithique précéramique au Proche-Orient. Antibes. Pp. 25–32. Rosen S.A. 1997. Lithics after the Stone Age: A Handbook of Stone Tools from the Levant. Walnut Creek–London–New Dehli. Rosen S.A. 2011. 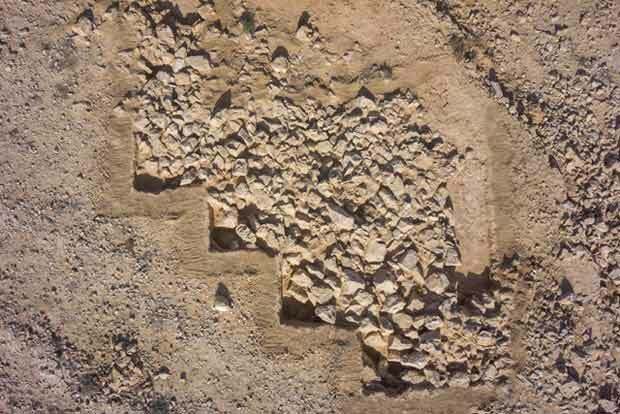 An Investigation into Early Desert Pastoralism: Excavations at the Camel Site, Negev. Los Angeles. Rosen S. and Golan K. 2016. 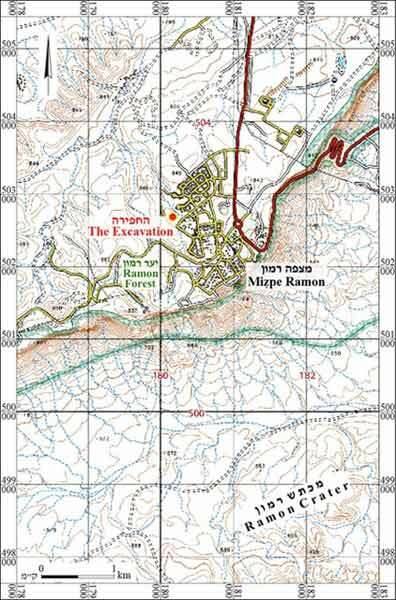 Map of Mizpe Ramon (201) (Archaeological Survey of Israel). 2. The excavation areas, looking northeast. 3. The Neolithic quarry, view from above. 4. Area A, in situ flint lenses. 5. Area C, in situ flint lenses. 6. Blade cores from the surface assemblages. 7. Flakes cores from the surface assemblages. 8. Tools from the surface assemblages. 9. Tools from the surface assemblages.